DETROIT – Rick Hendrick, owner of Hendrick Motorsports and chairman of Hendrick Automotive Group, has purchased the first Chevrolet Volt offered for sale. Proceeds will benefit science, math, engineering, and technology education initiatives through the Detroit Public Schools Foundation. The vehicle, bearing the vehicle identification number BU10002, was sold for $225,000 through an online auction that closed Tuesday, Dec. 14. “This was an opportunity to own a piece of history while giving back to the community,” said Hendrick, an avid car collector. “I have been a Chevrolet dealer for more than 30 years, and the Volt is one of the most exciting and important new cars since we opened our first dealership in 1976. 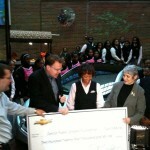 “This is another example that we are at a turning point in corporate support for Detroit Public Schools, as evidenced by this largest-ever GM gift to DPS, the $27 million contribution for small schools, other support from national companies like PNC Bank, and the launch just yesterday of the DPS Business Corps to connect every one of our 142 schools with a new business partner,” said DPS Emergency Financial Manager Robert C. Bobb. It costs $50 per student to compete in the annual Science and Engineering Fair of Metro Detroit, including entry fees and bussing expenses. The fair is open to students in Wayne, Oakland, and Macomb Counties, from grades six through 12. 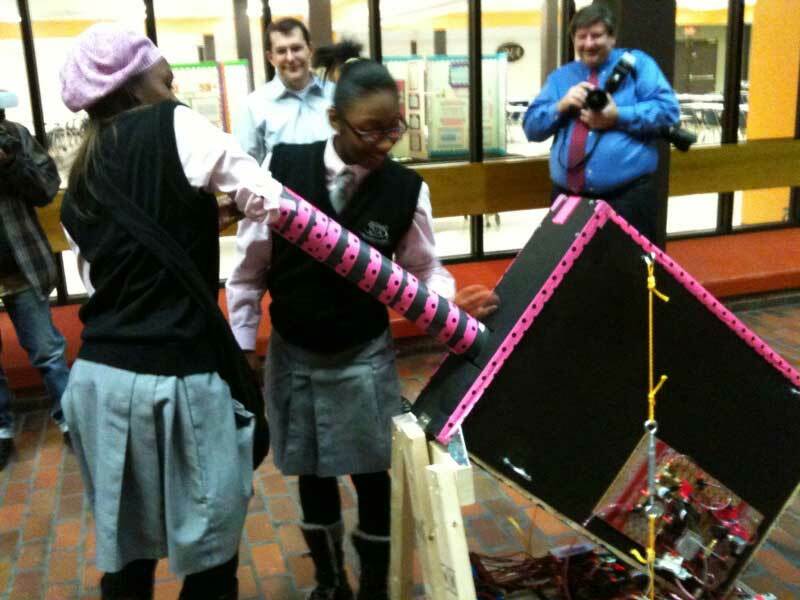 Each year up to eight students from the Detroit competition may be selected to participate in the International Science and Engineering Fair. The $280 kit for the FIRST Lego League robotics competition includes everything a team needs to build an autonomous robot. 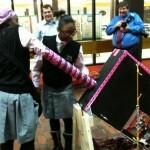 The competition, for students in grades four through eight, is based on students’ scientific research, as well as their robotic construction and programming. It costs $16,000 to send 10 students and chaperones to NASA space camp in Huntsville, Ala., including tuition and travel expenses. During the five-day camp, students apply classroom math and science skills to shuttle training missions, such as moon walking practice and orbiter-egress training. The Chevrolet Volt is an electric vehicle that can operate under a range of weather climates and driving conditions with little concern of being stranded by a depleted battery. The Volt has a total driving range of up to 379 miles, based on EPA estimates. For the first 35 miles, the Volt can drive gas- and tailpipe-emissions-free using a full charge of electricity stored in its 16-kWh lithium-ion battery. When the Volt’s battery runs low, a gas powered engine/generator seamlessly operates to extend the driving range another 344 miles on a full tank. 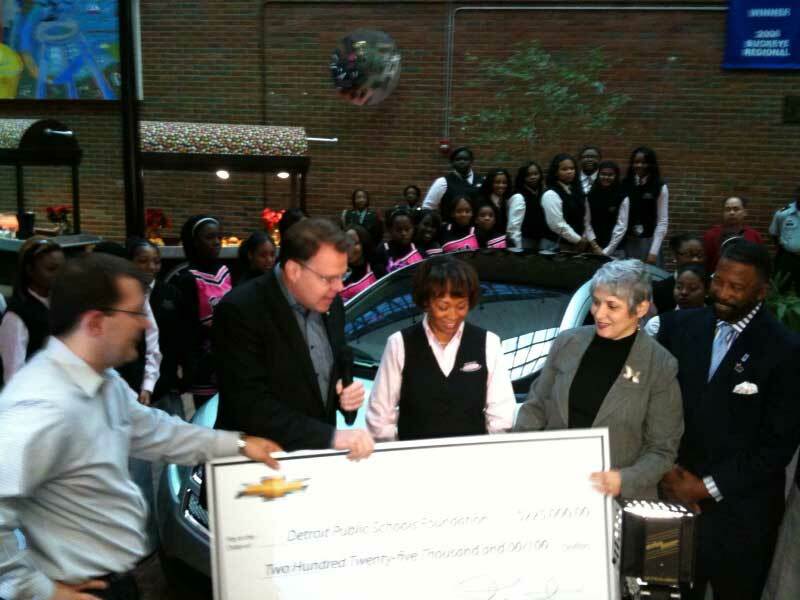 Chevrolet began shipping Volts from Detroit-Hamtramck Assembly this week. Hendrick will take delivery of his Volt later this month. Founded in Detroit in 1911, Chevrolet celebrates is centennial as a global automotive brand with annual sales of more than 4 million vehicles in 130 countries. In the U.S., the Chevrolet portfolio includes: iconic performance cars, such as Corvette and Camaro; dependable, long lasting pickups and SUVs, such as Silverado and Suburban; and award-winning passenger cars and crossovers, such as Malibu, Equinox and Traverse. Chevrolet also offers “gas-friendly” solutions, such as Chevrolet Cruze Eco with an EPA-estimated 42 miles per gallon highway, and the Chevrolet Volt offering 35 miles of electric driving and an additional 344 miles of extended gasoline range, according to EPA estimates. Most new Chevrolet models offer OnStar safety, security, and convenience technologies including OnStar Hands-Free Calling, Automatic Crash Response, and Stolen Vehicle Slowdown. More information regarding Chevrolet models, fuel solutions, and OnStar availability can be found at www.chevrolet.com. About the Detroit Public Schools Foundation The Detroit Public Schools Foundation is a tax-exempt 501(c)(3) organization dedicated to supporting Detroit students. Our mission is to raise, manage and steward funds and other resources to support value-added programs and activities for the benefit of the Detroit Public Schools and its students. For more information, visit www.detroitpsfoundation.org. The school’s mission is to equip students with the skills to be positive, competitive, articulate and competent leaders in the school, community and in an ever-changing global society. Students and staff, who wear uniforms, are creating a “community of sisters” that stresses academic achievement. The older students are part of a “Sister to Sister” mentoring group, tutoring elementary and middle school students before school, after school and during the lunch hour. The academy’s seventh-grade students participate in “Project Citizen,” a program sponsored through the Center for Civic Education that earned Superior ratings in both state and national showcases. Detroit International Academy also has a heavy emphasis on reading, sponsoring a “100 Book Challenge,” where students are challenged to read 100 books or more. Last year, nine students met the challenge and were awarded Kindle book readers. The academy also offers competitive sports and activities, such as volleyball, basketball, swimming, tennis, cross-country, cheer, citywide dance, and a JROTC battalion, whose Color Guard was designated first place in the district. 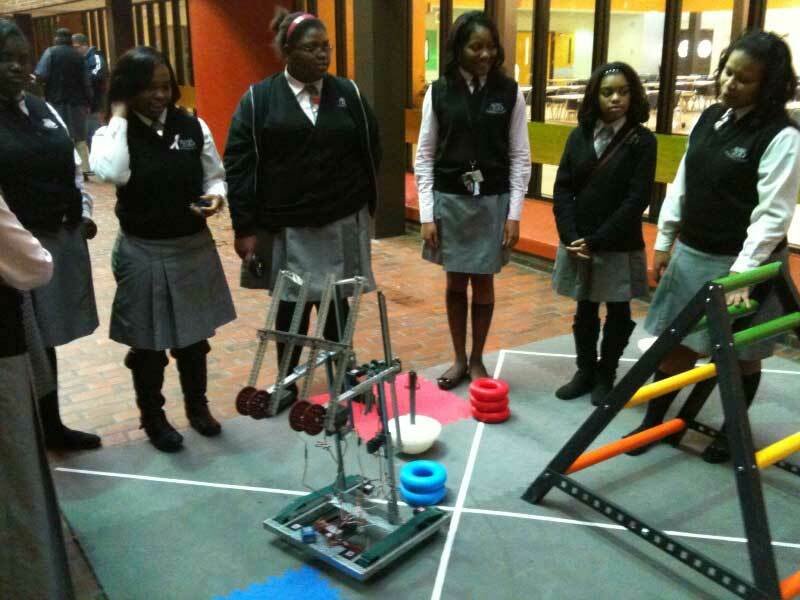 The school’s all-girls robotics teams are highly competitive. The robotics program offers four branches: a robotics class for students in grades 9-12 where students learn C++ programming, sensors, mechanical and electrical engineering concepts and more; an after-school Lego robotics team for grades 5-8; and after-school VEX team; and an after-school FIRST team in its fifth year, which recently won first place in a local competition for its robot that can target and launch T-shirts 40 feet away. 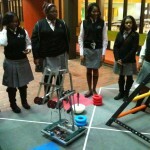 The VEX team recently placed in the top 4 percent in the 2010 VEX Robotics world championship. 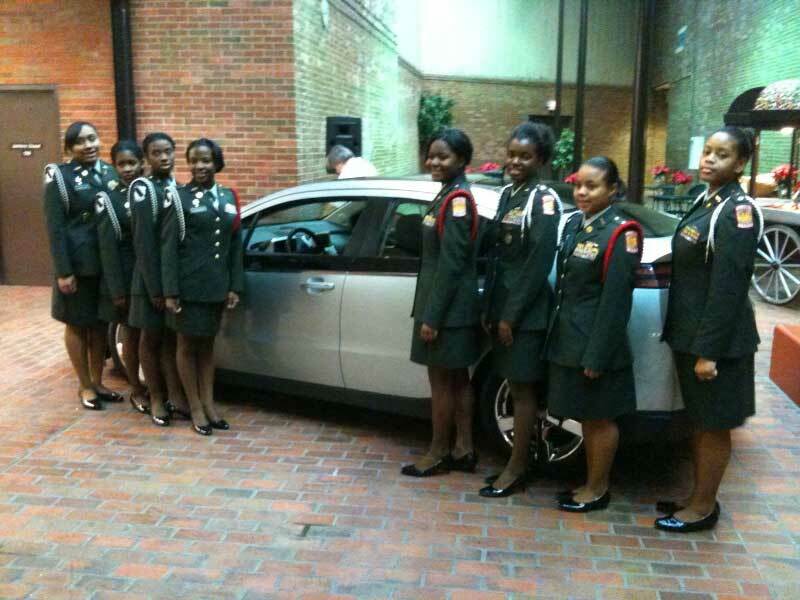 JROTC students from Detroit International Academy stand in front of a Volt before an announcement on the winner of the Volt auction to benefit the DPS Foundation.